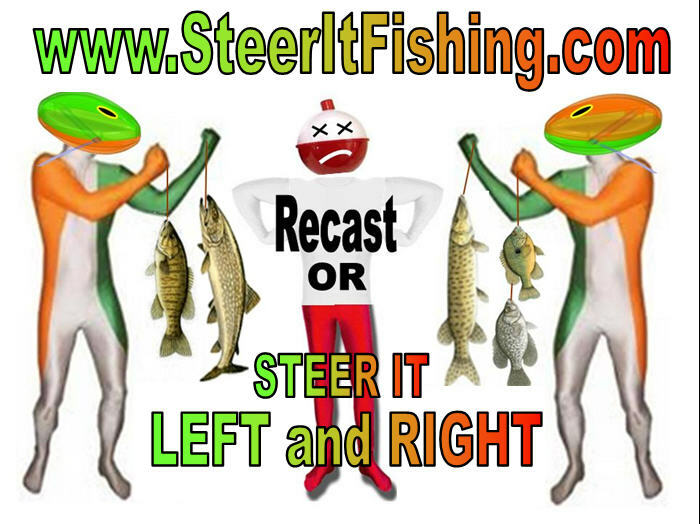 Home > Why use Steer It Fishing floats? All of BulletBobber Enterprises planers are steerable fishing floats that move left and right and flip direction when given a little pop to give you TACTICAL ADVANTAGES. They provides 3 dimensional fishing techniques, literally, breaking out of the traditional 2 dimensional fishing restraints by adding side to side direction control. The challenge in fishing can be summarized in one statement. It does not matter what size or species of fish you fish for or type of rod and reel you use to fish. Until the invention of the BulletBobber there were only 3 basic fishing techniques available for shore fisherman. 1. Stationary bait on the bottom. 2. Suspended bait using a fishing float (fixed depth or slip rigged). You really don’t have to try too hard to visualize how limiting these options are in a 3 dimensional world. Look at the shore fishermen from 100 foot above casting and retrieving and you’ll see the line go out and come back on the same path (unless pushed by the current towards the bank). Look sideways at the cross section of a “cast and retrieve” and you’ll see that controlling the retrieval speed is required to control the depth. Lipped lures go deeper when you reel faster where all others rise up but they all stay on the straight path as seen from above. The BulletBobber is the only device that can get off the path and allow you to steer left and right. The BulletBobber is the only device that extends the distance your lure travels beyond the distance you cast and can travel up to 10 times further then the length of the cast! This invention has opened up fishing literally and laterally to make fishing much more 3 dimensional and much more fun. The BulletBobber is a fishing float that glides left or right when you reel or if there is a current and it flips direction with the flick of the wrist. It totally eliminates the need to recast if there is some current or allows you to hold position in a current. If there is no current you can reel to make it go left or right with on-demand direction control. The BulletBobber has 4 flutes (2 wings and 2 keels). It has an eccentric or angled hole that runs through the wings. 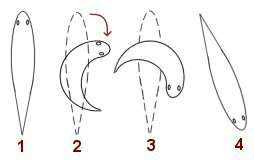 You thread your fishing line through the hole and put in a little plastic wedge pin to secure the line and lure to the depth you want. Or you can slip rig it for full 3 Dimensional controls all from a single line. There is a lot of info available about what type of action will best get a finicky fish to hit i.e. the C-Start Response Trigger. What it boils down to is, if a prey fish changes direction it will trigger a response strike from predator fish. It pulls the trigger.